Shetlands are a primitive breed of sheep from the UK that come in a wide variety of beautiful colors with 11 main colors and 30 markings. There are three diiferent coat types: single-coated (usually short and very crimpy); long/wavy (medium length and crimp); and primitive/double-coated (very long, usually straighter, but still soft). Some of the primitive Shetlands shed and are “rooed” where the wool is pulled off by hand. They are one of my favorite breeds and some of the prettiest sheep IMHO. This is a lovely fleece I bought recently from Sycamore Farms in North Carolina. The sheep is named "Kalmia" and she is a black/brown ewe with Smirslet markings. According to the North American Shetland Sheepbreeders Association, Smirslets are dark-colored with white around the mouth and frequently a narrow band of white extends to the top of the head. This fleece is long and wavy, with a soft undercoat and some long coarser wool that you can see in the light colored tips. The color ranges from a medium to light brown to grayish with blonde tips. 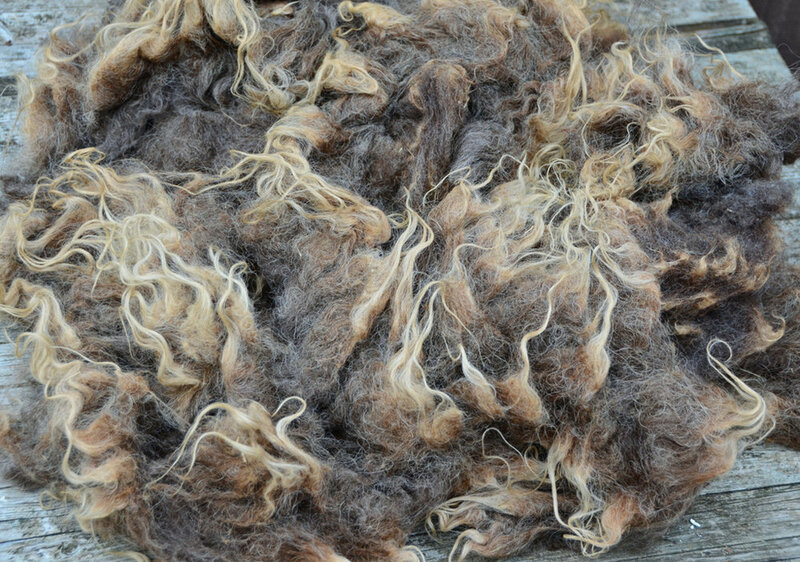 A little bit of the darker brown from near the extremities can be seen in the picture of the whole fleece. Shetlands have low grease, so you don't see much of a difference before/after washing in these photos. To wash this fleece, I rinsed it in warm water first then soaked it in hot tap water with detergent for 20 minutes and then rinsed again. That was it. Easy! All images © Elysa Darling | 222 Handspun. Do not use without permission.